Thursday night, I was walking around the house and noticed a disposable camera on a shelf. Rather than walking past it as I had a number of times, I picked it up. It had expired in October 2006, but I wondered if it could still be developed. The answer...sort of. Many of the pictures were ruined due to brown splotches on them. Some of them were OK, to one extent or another. A few were from a trip we took two-and-a-half years ago to Tecate, Mexico. 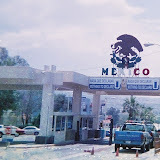 When we were in San Diego for the summer, we drove down to the border one day and walked across. Tecate had the advantage that it wasn't really very touristy. We had a nice lunch, then looked around for other things to do. Then, not being touristy became a disadvantage. The brewery was closed (we may have gotten there too late), and there weren't any souvenir shops. We went into a couple of stores and bought some random stuff (I got some plastic playing cards) and then went home.